The Rage One-One is a tough off-road wheel that is not only stylish, but functional. A rugged wheel with a mesh style design, it comes with a bolt on scratch guard with zinc plated bolt hardware, Grade 8, for superior off-road protection. The wheel comes in full painted matte black, matte black with blue tint, matte black with red tint, or gunmetal finish. 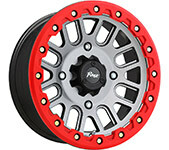 The Rage One-One is offered in popular 12, 14 and 15 inch ATV UTV fitments and features a bolt on center cap. The One-One will be the envy of any off-road machine hitting the trails. The scratch guards are sold in sets of (2) in 12, 14 and 15 inch sizes. These rings are not currently available to purchase online, please speak with a sales associate by phone to order these optional color rings. 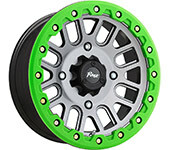 , please speak with a sales associate by phone to order these optional color rings.